The Federal Communications Commission has allocated a high-frequency spectrum for the next phase in wireless cellular technology. But critical questions about the safety of this technology remain. Thousands of published studies over the past fifty years have established indisputable evidence of harmful health effects from exposure to microwave or radio-frequency (RF) radiation. The build-out of 4G/5G technology will require a dense network of millions of RF antennas, deployed in neighborhoods in towns and cities across the country, resulting in continuous, involuntary exposure for Americans in their homes, schools and businesses. Concurrent with the rollout, telecom companies are aggressively promoting state legislation that eliminates the rights of local governments to control the installation of “small cell” 5G antennas in public “rights of way.” This unprecedented appropriation of local control would override FCC regulations and the Telecommunications Act, and would prevent local authorities from exercising their duty to consider property values, safety or aesthetic issues related to 4G/5G technology. • 5G mobile wireless networks can deliver large amounts of data over short distances, resulting in faster internet speeds. The primary purpose of 5G is to allow telecom companies to compete directly with cable companies, and increase the capacity of “smart devices” and machine-to-machine communications - the “Internet of Things” (IOT). 5G is not necessary for public safety. • 5G wireless networks will utilize millimeter waves (mmWaves). Current cellular and WiFi networks rely on microwaves that employ frequencies up to 6 gigahertz (GHz). 5G technology will use millimeter and sub-millimeter waves in higher frequency ranges (between 30 GHz and 300 GHz). This technology has not been widely deployed before. • 5G antennas will be placed on millions of utility poles, lamp posts and commercial buildings. 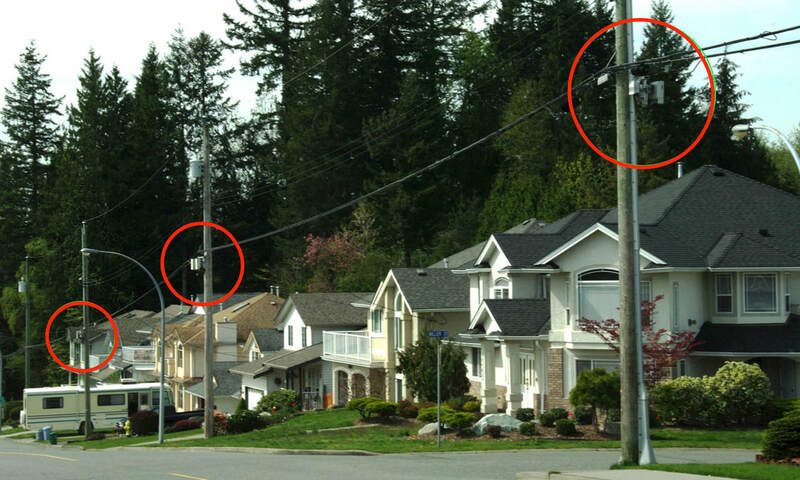 5G networks require many closely-spaced antennas in order for the short wavelength mmWaves to travel through buildings or other obstacles, including foliage on trees. This will require a very dense network of antennas. • “Small Cell” does not mean small, unobtrusive equipment. It means that every cell provider will hang its own antennae enclosure (up to 6 cubic feet each) on the pole, with other associated equipment (up to 28 cubic feet - the size of a large refrigerator) located nearby. • Exposure to all types of wireless radiation is associated with cancer and other health effects. The World Health Organization has classified wireless radiation as a Group 2B “possible human carcinogen,” and a recent study conducted by the National Institutes of Health has corroborated this finding. Studies have also found that typical exposures to RF radiation can cause disruption of normal brain development in fetuses and learning disabilities, heart abnormalities and electro-hypersensitivity. Populations especially at risk from this type of radiation include pregnant women, children, the elderly, and individuals with implanted medical devices, cardiac and neurological problems. • mmWaves have unique health impacts on the human body. Sweat ducts within our skin, the largest organ in the human body, act as antennae when in contact with mmWaves. The waves penetrate 1 to 2 millimeters of human skin tissue and are also absorbed by the surface layers of the eye’s cornea. • Plants and animals are also harmed by wireless radiation. Studies have found that electromagnetic radiation from mobile phone cell sites damages trees, and several studies have clearly demonstrated that radio-frequency radiation changes the makeup and structure of plants. Many research analyses also cite wireless technology as a contributing factor in the decline of bird, frog, bat, and honeybee populations. • The FCC is pushing for implementation of 5G without considering its potential impacts on public health. To date, the U.S. government has failed to update its exposure standards for wireless radiation, despite warnings from other branches of government, including the Department of the Interior (DOI), that the FCC safety standards are 30 years out of date. These standards consider only thermal (heat) effects, not other biological effects below the heating threshold which are now well-established scientifically.